Woody Baron finds the spectre of tangling with a hulking offensive lineman much less daunting than sitting before young children. 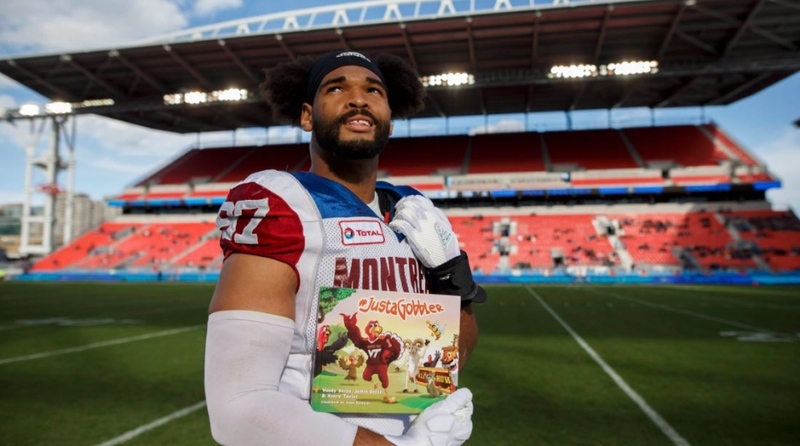 The Montreal Alouettes rookie defensive lineman has co-authored a book entitled .JustaGobbler with his uncle, James Baron, and Henry Taylor. The 38-page hardcover publication was released in August for third- and fourth-graders. Baron did his first reading last week at an after-school program in a Montreal church and held his first in-school session Monday. The six-foot-one, 270-pound Baron feels more anxiety preparing to read to a young audience than engaging an ill-tempered 300-pound centre or guard. "I get butterflies before I do any of that like any person does," Baron said in Toronto last week before Montreal's 26-22 road loss Saturday to the Argonauts. "But then I realize I know the subject matter and what I'm talking about and I'm not trying to do anything out of the ordinary and that kind of brings me back down to earth." Baron said his uncle approached him about the book in 2016 when Baron was still at Virginia Tech. Although the project took two years to complete, Baron couldn't be happier with the finished product. "My uncle went to Virginia Tech some 20 years before I did and the book being centred around that, it felt like a good fit, an easy transition and something to get into," Baron said. "I love to write and so it felt like a perfect introductory project and it's proved to be that and more. "I just remember it being such an exciting idea and being able to see it now in person, it's gone above and beyond anything I could've imagined. The illustrations are so unique, so vibrant, so attractive and the book's message is so versatile. You can take it to anybody and they'll be able to digest it." The book's central figure is the Virginia Tech Hokie, the school's turkey-like mascot who's very excited about an upcoming talent show. But as he learns what his friends will be doing at the show, the mascot's self confidence diminishes because he's focusing too much on others and not what he can offer. "Slowly but surely his confidence kind of dwindles throughout the book until the end when he's reminded of how much he has inside of himself," Baron said. "He's able to rebuild his confidence and be proud of what he can offer. "It's all about self belief, self confidence, knowing who you are, being proud of it and always believing in yourself. I think the message is great for everyone." "It's a message that can reach everybody at different levels, myself included," he said. "There are so many things going on outside of your own peripheral that it's easy to get distracted. "But then you have so much to offer in yourself." Baron said the project was a labour of love because he always enjoyed writing -- be it fiction, non-fiction or even thesis papers -- while attending elementary and high school in Nashville. "The majority of my writing nowadays is journalistically in a private format," he said. "It's something I like to do as a hobby. "I'm kind of using this book as a litmus test to see how that goes professionally. Writing makes me happy." Baron would readily welcome other writing opportunities -- even in journalism -- and is receptive to doing another children's book. "I'm so open to the different opportunities right now," he said. "I think (another children's book) is the plan down the road but for the time being we're just getting started. "We've just scraped the tip of the iceberg with the book we've started now." All three authors have a football background. James Baron, 45, played at Virginia Tech after transferring there in his junior year. The six-foot-four, 260-pound defensive lineman was a team captain as a senior and later played 12 seasons in the Arena Football League (1997-2008). Taylor, 42, was a six-foot-two, 295-pound defensive lineman at South Carolina who played in the NFL with Detroit, Atlanta, Chicago and Miami (1998, 2000-01) and defunct World League of American Football (Frankfurt Galaxy, 2000). He also spent time in the AFL, becoming teammates with James Baron in '05 with the Nashville Kats. The two have remained friends since. Woody Baron was a four-year letterman at Virginia Tech (2013-2016) and also served as a team captain. He was a '16 first-team All-ACC selection after registering 50 tackles (17.5 for a loss) and 4.5 sacks. Baron signed with the Dallas Cowboys as a free agent in 2017 but was among their final cuts. He has 23 tackles and three sacks in 16 games with Montreal. "It (CFL) is different game in terms of structure and some of the rules but I'm having a blast," Baron said. "When I first came here I had no preconceived notions because my knowledge of the CFL was limited to what I'd seen on ESPN growing up. "I didn't know anybody who'd been here or played in the league so I pretty much had no expectations. But it's all football . . . you can get after it just like you have been and that made me feel comfortable." Baron remains under contract with Montreal through the 2019 season and fully intends to honour that commitment. But he'd also like another NFL opportunity and believes the CFL is providing solid preparation for that. "There's no better teacher than experience," he said. "Even though it's a different league, it's still football. "Getting to play all the snaps I have here can't hurt in the end."